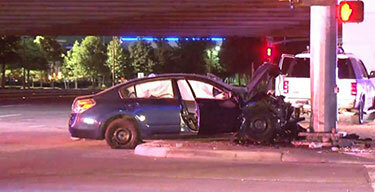 HOUSTON (September 19, 2018) – The Houston Police Department (HPD) responded to a collision around 1 a.m. on Wednesday near Katy Freeway and Gessner. A male driver of a blue Nissan Altima was heading west on the frontage road, ran a red light and slammed into a traffic signal. He was transported to a local hospital with non-life threatening injuries and remains in stable condition. His female passenger was not wearing a seatbelt and suffered fatal injuries. She was transported to Memorial Hermann Greater Heights Hospital and was later pronounced dead. HPD has not identified the man or the woman. They continue to investigate to determine if alcohol was a factor in the car crash. If you have been involved in a car accident and will like to obtain a free copy of the crash report, visit MyTexasInjuryLawyers.com. If you or a loved one was involved in car accident, it is important to contact a car accident lawyer to help you evaluate your options. Call (713) 987-7111 or send us an email to discuss your car accident injury case. Where Does Houston Rank Among Cities with the Best Drivers?